Before I even begin, I have to recognize that this event happened over 3 years ago and much of what I wrote below I wrote in 2011. However, I never finished it until today and have now finally posted it. Geez, talk about procrastination! Our first half marathon story actually starts almost 7 months before we ran it. February 2011 - we had been running regularly for 18 months or so, with our long runs being 3 miles. I had just returned from Non-Commissioned Officer Academy (NCOA) and my Supervisor, MSgt Newton, encouraged me to sign up for a local 10k. I said I would think about it - 6 miles was a huge distance at that point since I had never run farther than 4 - and I talked to Kelley about it. She was up for the challenge and encouraged us to go for it. So go for it we did. It was challenging, but not overly so, and we liked the environment and atmosphere of a race. See all the pictures from our first half marathon! A couple months later we start hearing chatter about the upcoming Air Force Marathon in September and how many people I work with are going, including my Supervisor. It didn't take a lot of encouragement for Kelley and I to decide to give the half marathon a try. We figured 4 months was a suitable training time and set out to increase our maximum distance run. We ran as far as 11 miles 2 weeks for the race and then rested up with nothing but short runs leading up to the race. 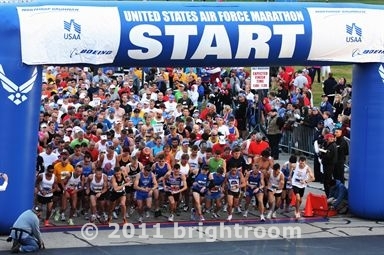 We left for Dayton, Ohio - the site of the marathon - on Thursday morning at a crazy early time. We got up at 3:45 and left for the airport at 4:30. It was around 75-80 degrees when we left, even that early. We arrived in Dayton at 10am and it was 48 degrees and windy. I had shorts and a T-shirt on. It was insane. After waiting for what seemed like a long time in the rental car lot, we finally got our car and were off to Kelley's parents' house. She had an online conference she needed to attend, so we were rushed to get there, only to find out that the conference was rescheduled. After settling in, we left to go get lunch. Our meals were somewhat scheduled so that we could get all the delicious food from Dayton that we could not get in Augusta. One thing Augusta lacks is any sort of Mongolian Barbeque place. So, we went to B.D. 's Mongolian Grill for lunch, and it was pretty good. Not as good as Khan's in Omaha, but still tasty. Afterwards we shared a small Cold Stone Creamery creation, picked up a slice of cheesecake from Cheesecake Factory for my post-race treat and headed to the Nutter Center to pick up our race packets, then we headed back to the parents' house. Not long after getting back we had to get ready to leave for Cincinnati, where we were going for dinner and a Reds game. Our dinner stop was a place called Naked Pizza - a pizza place that uses all natural ingredients. We thought it was a sit down place, but it wasn't, so we ate the pizza and breadsticks in our rental car. It was good, but not fantastic, and then we left for the stadium. Our seats were in the third deck behind the plate and it was like a wind tunnel up there. We dressed as warm as we could, but we did not bring adequate cold weather gear, so we were cold the whole night, and since it was unusually and unexpectedly cold, they were not selling hot chocolate, so we had no warm up mechanism. With that, and knowing that we had a long drive home, we left early and listened to the rest of the game on the way home. Good thing, too, because it went into extra innings. 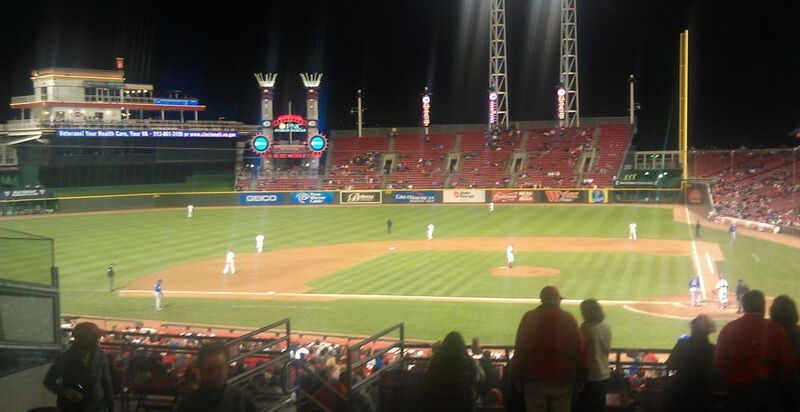 But, the Reds won in extra innings just before we got home, so it all worked out. Friday was basically a huge drag. I had a headache pretty much all day and lounged around doing a bunch of nothing, mostly. We stayed home most of the day because Kelley had to get work done (she can work away from the office with her laptop) due to her boss also being out of the office. The highlight of the day would have to be lunch, where we tried SmashBurger for the first time. We got the chicken sandwiches and fries, but Kelley got the sweet potato fries. We loved it, so much so that when we went to Atlanta a short time later, we made a point to go again. For dinner we went to Olive Garden with Kelley's mom to load up on carbs for the race. We got to bed at a reasonable time, but didn't sleep the best, probably due to the excitement of the upcoming race. Saturday morning came and the cold weather that plagued our visit so far remined. It was in the 40s when we woke up, with a race-time temperature projected to be around 48. Not what we were expecting, and far from ideal, since we would be running for 2 1/2 hours and it would get warmer. We didn't want to freeze in the beginning or be too hot later. We both ended up deciding on an in-between approach that left us quite cold at the beginning, but not too hot later. We were told to show up 1 1/2 to 2 hours early and when we got there we understood why. The crowd and pile of cars trying to get on base was ridiculous. We drove past the first entrance we saw that had cars backed up for about a mile and went into another entrance where we got right on base. Once on base we still had to wait in a huge line to park, though. Once parked, we had to walk around a mile to get to the starting line area where we checked in our bags. All told, from the time we left the house until we were at the starting area ready to go was probably around 90 minutes. 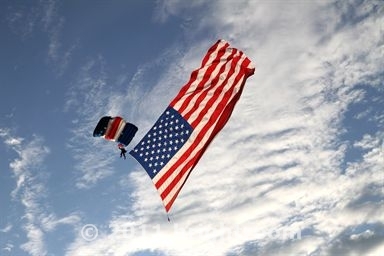 Before the race started a skydiver came down with a huge American flag, and right before the gun went off, a pair of F-15s flew over as the crowd cheered. When the gun did go off, I was shocked at how loud it was. I was a couple hundred feet from it and it was still crazy loud. Because of the massive crush of people, it took us over four minutes to get to the starting line after the gun went off. After that it was nice for a while - a little cold, but it was nice running around the Wright-Patt area. After a few miles we started warming up and we continued to enjoy the scenery. There were water/Gatorade stations about every mile or so and the people there were very peppy and energetic. Around the halfway point we got to try some energy goo they were handing out and we both found it hideous - so hideous that we could not eat it. There was a video spot at the halfway point that was cool, and then we settled in for the super long second half. Somewhere around mile 8 we got to run over a highway overpass - that was really not fun at all. After that there was a lull where it was just one foot in front of another for miles and miles. Then the pain came. Pain with each and every torturous step. Starting around mile 11 or so the run became less of a run and more of an exercise in mental endurance. Finally, after 13.1 long miles and 2 hours and 25 minutes later, we crossed the finish line and got handed medals from some Generals stationed at Wright-Patt. It was really cool. The snacks in the test were really good also. We met up with Kelley's mom after the race and got some pictures then left for our post race meal at Penn Station East Coast Subs. I did not feel bad about a big sub and a pile of fires after that! From there we headed back to Kelley's parents' house to clean up and rest and watch some college football. Later, for dinner we Donatos Pizza, capping a fantastic day of food.